A smartphone manufacturer has set up its first factory in Nigeria’s commercial hub of Lagos to provide Africa’s biggest mobile market with low-cost smartphones amid an economic recession. 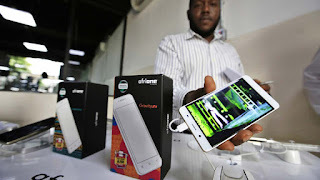 AfriOne’s devices, using the Android operating system, will cost from 29,000 naira ($92) to 33,000 naira, targeting middle-income buyers in a country of about 180 million people, according to Lekan Akinjide, director of strategy and government coordination at the company. Its first factory has an installed capacity to produce 120,000 units per month, with one other factory planned, he said Friday at an event in Lagos. Parent company Contec Global invested $10 million in the project. Cheaper smartphones are pushing internet penetration in Nigeria, with most people getting online via mobile devices rather than computers. The country had 154 million active mobile-phone users as of February this year, according to data from the Nigeria Communications Commission’s website. Lagos-based AfriOne, which has developed a financial technology app, is also betting on the growth of e-commerce, which will account for 10 percent of all retail sales in the continent’s largest economies by 2025, or some $75 billion in annual revenue, according to consulting firm McKinsey.